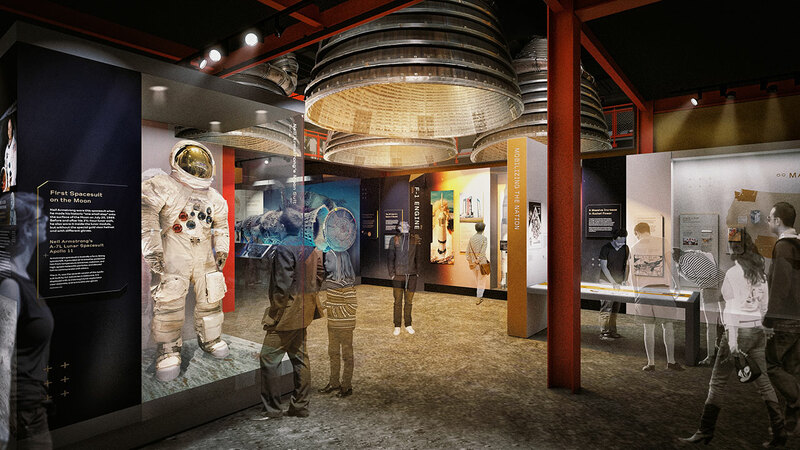 — The Wright Flyer, John Glenn's Mercury spacecraft and the Apollo 11 spacesuit that Neil Armstrong wore on the moon, among hundreds of more air and space artifacts curated by the Smithsonian, will soon be exhibited in a renewed space in Washington, DC. 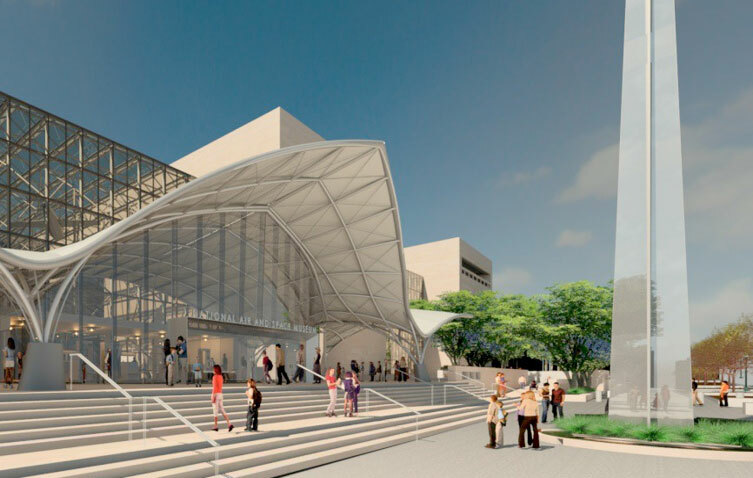 The Smithsonian on Wednesday (Oct. 25) revealed plans to revitalize the National Air and Space Museum over the next seven years. The $900 million project will be achieved on a phased schedule so that many of the artifacts remain on view as the construction continues. "It is ambitious, but it's a needed renovation of the building and an opportunity to create a new experience and new exhibitions, and to put other artifacts on display that would have otherwise happened in a more incremental way," said Peter Jakab, chief curator at the museum, in an interview with collectSPACE. "We're being pushed to do bigger and bolder things than we might have done, but that is good." Originally, the museum anticipated needing only to replace the heating, ventilation and electrical systems, which after nearly 40 years had outlived their lifespan. But in planning to do that work, it was discovered that the building's outer stone was in a significant state of disrepair, requiring that it too needed to be replaced, Jakab explained. "So, that changed the game in terms of the extent of the renovation and revitalization," he said. "Once that step was realized, it created the opportunity that all of the exhibitions would have to be touched in some way." The building will undergo a complete refacing of its exterior cladding and its mechanical systems will be replaced. The visitor experience inside the museum will also change with all 23 galleries and presentation spaces being updated or completely redone. The work will be divided into separate stages, beginning in summer 2018, with part of the building open to visitors at all times. Construction is set to start on the west side of the museum, which houses nine galleries, including "Exploring the Planets." Some of the exhibitions have not significantly changed in the 41 years since the museum opened. The Milestones of Flight Hall, which visitors first encounter when entering the building, was renovated in 2016 and will be among the last areas of the museum to be touched. To safeguard the artifacts, most will be temporarily moved to a state-of-the-art storage facility now being built near the Air and Space Museum's Steven F. Udvar-Hazy Center in Chantilly, Virginia. 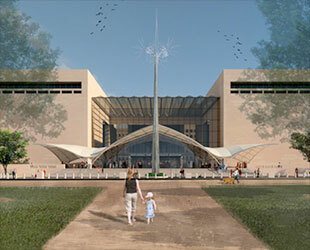 Some of the objects in the National Mall building though, are too large to transport and will need to be worked around. "For example, the Skylab [backup orbital workshop] will be protected in place as that is quite a large and difficult thing to move," said Jakab. After the artifacts return to the museum when construction is complete, the new collections facility will be used to hold other museum items not currently on display. Many of the galleries are being reimagined and remodeled to engage visitors while they are at the museum and after they leave. "We really are trying to redefine the museum in terms of it being an experience than being a place," Jakab said. "We want to a create a seamless experience that is both digital online, as well as walking the galleries in the building." When the new exhibitions begin to open in 2021, visitors to the museum will see some of the artifacts in new settings. 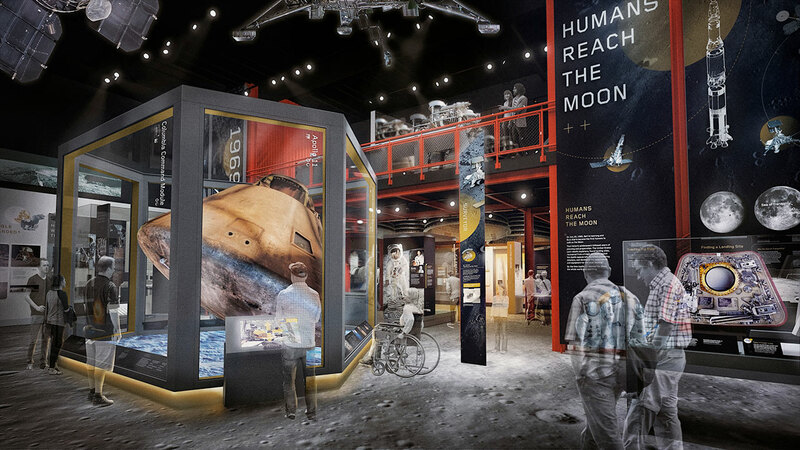 For example, the Apollo 11 command module, Columbia, will be exhibited in a custom-designed, climate-controlled case in "Destination Moon," a new gallery taking the place of the current "Apollo to the Moon." Recently captured 3D photography of Columbia's interior will be shown alongside the spacecraft, revealing components that would otherwise remain hidden from public view. 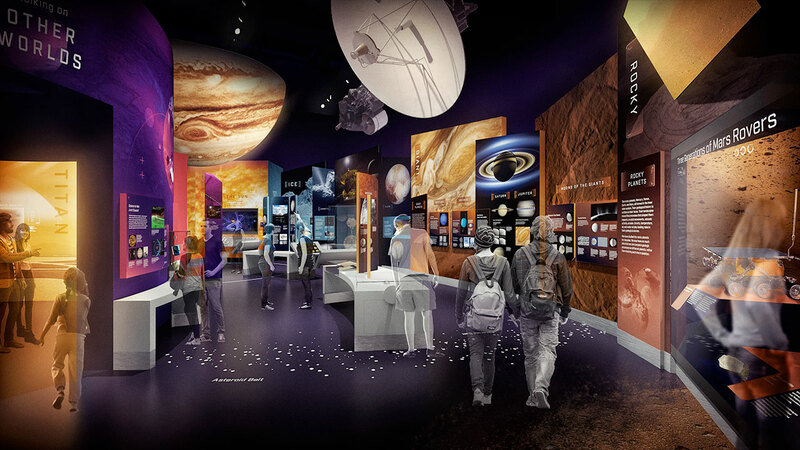 Each of the exhibitions will also include new presentation spaces, allowing the public to engage with content experts through demos and discussions, all shared through online webcasts. 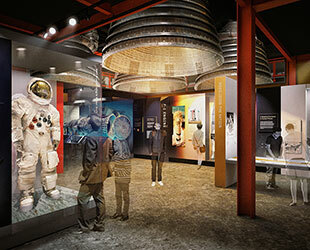 Instead of simply relaying information, the new galleries will offer hands-on experiences. 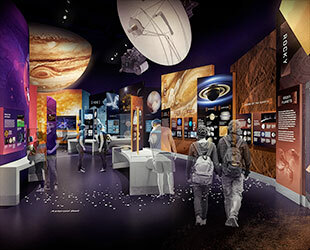 In the remodeled "Exploring the Planets," for example, visitors will tour the solar system and take a walk on another world through an immersive experience. The exhibitions throughout the museum will be grouped by theme to allow for an easier way finding and a better visitor experience. "We will be collocating galleries of similar subject matter," said Jakab. 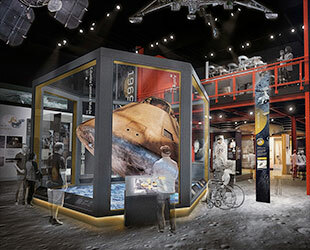 "We will have a space exploration suite, where we'll have three galleries next to each other: a gallery that is focused on Earth, "One World Connected," a gallery that focuses on the solar system and the planets, and then the re-do of our Apollo exhibition, "Destination Moon," which is one of our core subject areas." "So we will have an Earth-moon-planets series of galleries that will be adjacent to one another," he described. The Smithsonian has requested funds in its 2018 federal budget to begin the exterior and infrastructure work. In the years to come, additional funding will be requested. The Smithsonian estimates the total cost of the revitalization to be about $650 million. "Every indication we have thus far is that the members of Congress feel this isn't only a good project, but necessary. So we have a good deal of confidence that the full funding needed to make the repairs will come," said Jakab. 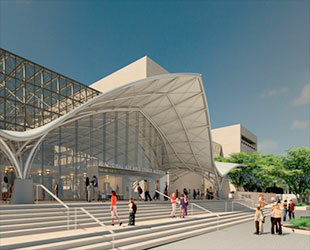 In addition, the National Air and Space Museum plans to privately raise the $250 million it needs for new exhibitions. 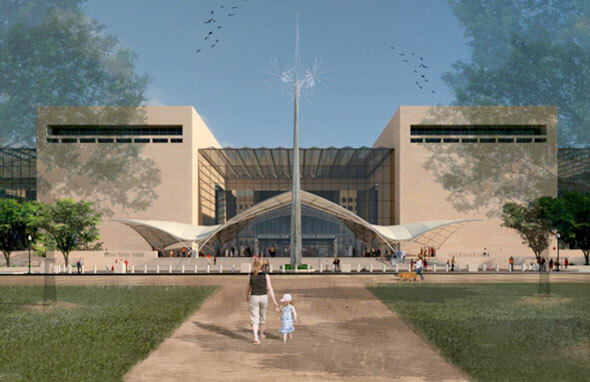 "The transformation of exhibitions begins a new era for the museum. We're developing innovative ways to experience America's favorite museum," said Gen. J.R. "Jack" Dailey, the museum's outgoing director.